So far I’ve not yet written much about Rinchen Lhamo. Partly because I think she is perhaps better known today than her husband, and partly because her husband’s story is perhaps more easily traceable. At some point though I would like to publish something about her as she is a truly remarkable woman. For the time being though I shall write a little more here (and in my next post) on what I know of her life and what I have discovered about her so far. Rinchen Lhamo (‘Precious Goddess’) is best remembered as the author of We Tibetans (Seeley Service, 1926). 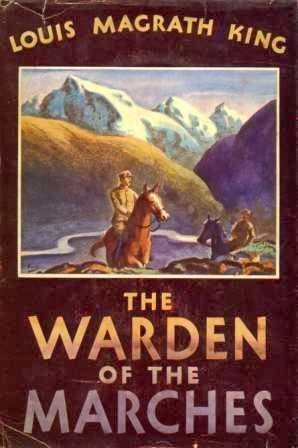 The book begins with a memorable opening line: “I am a woman of Kham, the eastern and most populous part of Tibet. My husband is an Englishman who was formerly British Consul on the Chinese frontier of Tibet.” Her book is remarkable because it is one of earliest accounts of Tibetan life and culture written in English by a Tibetan. It is certainly one of the fullest accounts too. 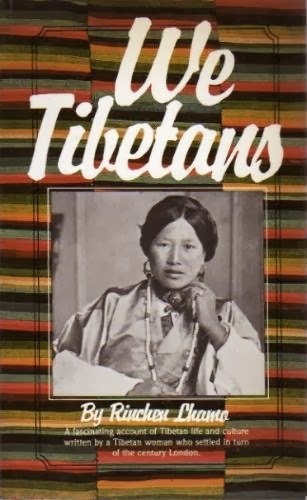 In its pages she discusses a wide range of topics relating to all areas of contemporary Tibetan life in the early 20th century, from the Tibetan landscape, farming, food, architecture, costume, women, religion, and family life, to examples of traditional Tibetan games and folktales. She even ventures to make comparisons between what she has seen and experienced of life in Tibet and life in the West. Hers is a distinctly astute eye. “It has long been [my husband’s] custom to translate to me what is said about Tibet in your books and newspapers. And so I have learnt how you regard our country and people. Some of your writers have written of us with knowledge and sympathy. They have known us and liked us. But they are just a few. The others seem to have said just what they liked or what they thought would attract notice. Some of the statements made about us display great ignorance, and others malice. Some are wrong but harmless; others made me laugh at the absurdity of them; still others made me angry. Why should people write falsehoods about us, why should they write at all of things they do not know? And I would urge my husband to write to the papers and contradict this statement about us and that. I realise, with my collateral family connection to Louis and Rinchen, I could well be accused of bias in this regard also – but, having read We Tibetans as well as Louis’s factual and fictional works several times over already, I would say that a distinction of authorial voice is clear. Certainly echoes of Louis can be heard in the pages of We Tibetans sometimes beyond a simple turn of phrase – but why shouldn’t that hint that he and his wife were of one mind on certain matters? Likewise, if one really reads Rinchen’s words closely and compares them to those of her husband’s published works a clear difference in tone and thought can be heard and seen. And certainly, anyone who has read Louis’s fiction may well agree that if Rinchen’s voice were entirely his creation it would have been an unparalleled feat of characterisation on his part! Personally, I think that there is little doubt that Rinchen’s is the real and genuine voice behind her book; its thoughts, views, ideas, and reflections are undoubtedly hers. To write her off as completely incapable of creating such a work wholly overlooks the unique fact of her own individuality – she was clearly a resourceful woman of singular character; she left her homeland to accompany her foreign husband into a life entirely removed from much of what she would have taken for granted growing up in Kham. Why should she not wish to write a book about what she knew of such a singular and remarkable life? And, needless to say, such a singularity was not lost on her contemporaries either. As I have written before, both she and Louis were feted by the English Press on their arrival in England in 1925.Numerous newspapers carried her photograph (with her wearing both Tibetan and Western dress) and interviews with her. And much to the couple’s annoyance, although she was descended from Tibetan nobility, she was often promoted to the ranks of royalty and dubbed a ‘Princess’ to furnish a good story! Rinchen was not the first Tibetan to travel to Britain though. Perhaps most notably she was preceded in 1913 (the same year as Louis first went to 打箭炉 Tachienlu / དར་རྩེ་མདོ། Dartsendo) by four young Tibetan boys who travelled to England to be educated at Rugby School; and, oddly enough there’s a further but completely separate connection here – this time between my immediate side of the family and Tibet, in that a close family friend is the daughter of a British doctor who was stationed at Sikkim (and recalls living there as a child) when Sir Basil Gould (1883-1956) was the British Poltical Officer there in the 1930s-1940s. 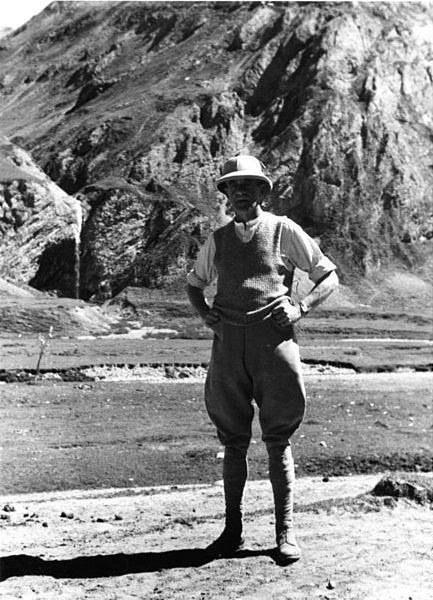 Sir Basil was the British official charged with accompanying the four Tibetan boys to England in 1913. Sir Basil Gould, photographed in 1938. Yet Rinchen was almost certainly the first Tibetan to marry an English national and quite probably the first Tibetan to make England her permanent home. Such cross-cultural relationships, particularly at this time, are fascinating. I’d very much like to know more about how they first came to meet, but here I fear there might yet remain a great and unbridgeable of lacuna in my researches. So far the few facts I have been able to find point to the likelihood that Louis and Rinchen originally met during his second term on the Sino-Tibetan frontier when he returned from the First World War and soon after he set off on his second extended tour of the region – however, another source would seem to hint that they may have met much earlier than this (although I’m not entirely sure how reliable this particular source might be for a number of reasons which I won’t go into here until I have more information in this regard). And other sources seem to indicate that she accompanied him on his travels through eastern Tibet. Would that this were not so! – But, for whatever reason Louis left this part of his and Rinchen’s story untold, hopefully my on-going researches might eventually bring to light more of what must have been a very special marriage between two truly remarkable individuals who managed to bridge two very different worlds into one, for all too short a time. Rinchen was just 28 years old when she succumbed to tuberculosis and was finally laid to rest in an English churchyard.